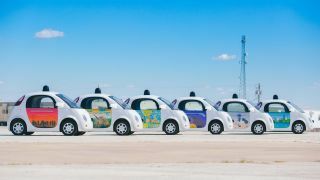 The future of transportation makes the AI "the driver"
Self-driving cars were once a Total Recall fantasy, but it's happening in our lifetime with Google at the wheel. As a car enthusiast who enjoys windy roads and track time as a therapeutic stress reliever, I'm not against the impending autonomous future of cars. Actually, that's far from the truth. Driving is fun, but traffic is about as enjoyable as a root canal -- it has to be endured and never at your leisure. Your favorite search provider is developing self-driving car technology, likely to improve safety and efficiency on the roads. (Or, of course, to give you more time to,relax, reply to emails, or peruse techradar during that dreaded daily commute. The Google self-driving car comes in two shapes - a modified Lexus RX450h and a cute jelly bean-looking prototype vehicle. Google's self-driving Lexus RX450h can be spotted driving around Mountain View, Calif., Austin, Texas, Kirkland, Wash. and Phoenix, Ariz. It's very easy to spot with Google logos plastered and large LIDAR sensors mounted all over the car. While the RX450h started life as a production car you can buy from any Lexus dealership, the prototype self-driving variant is engineered from the ground up for autonomy and the future of "driving." Google started with a fresh design that ditches the familiar dashboard, steering wheel and pedals for a compact car with plenty of legroom and space to work on a laptop while you ride. It's designed to operate with zero driver interaction so you can focus on maximizing the new Twitter character limits. There are emergency controls available, in case the self-driving car suffers a failure or damage, so passengers have control when needed. It's propelled by an electric powertrain, but Google doesn't provide any details. However, Google may be testing wireless charging capabilities to create a hands-free autonomous car riding experience. At the heart of the self-driving car is Google's artificial intelligence (AI), which relies on the vehicle's sensors to detect surroundings. The car is self-aware of its location on the road, including the lane, and objects of all sizes, like a cyclist or small children. The software constantly processes what its cameras, radar and LIDAR sensors see for a complete 360-degree view of its surroundings. It uses shapes and patterns to predict what a person or vehicle should do next and avoids them – whether it's a gentle swerve or yield. After testing self-driving cars since 2012, Google's autonomous Lexus RX450h had its first at-fault accident last February with a city bus. The RX450h lightly grazed a bus while attempting to avoid sandbags on the side of the road because it assumed the bus driver would yield. Ironically, Google received a patent for bus detection a month later, which lets the AI compare the size of vehicles against its database. If a vehicle exceeds the typical size of a car, it believes a bus is present and proceeds to compare the bus by color to see if it's a school bus. Before February 14, 2016, all accidents involving a Google self-driving car were the fault of inattentive drivers. Drivers crashing into the Google self-driving cars were such a problem that Google had to urge people to stop via a blog post. So in about four years, the Google self-driving car was only responsible for one minor accident, whereas 33,000 people die each year on US roads. Human error is responsible for 94% of those deaths. Despite the minor kerfuffle, the numbers heavily favor Google's self-driving car. This isn't surprising, though. AI doesn't get tired, drunk or text and drive like humans do.